It has the beauty of porcelain with strength of cast iron yet lighter weight. The insulated construction absorbs waste disposal noise and resists stain, rust, oxidation, chipping, and scratches. The surface can be polished with ordinary liquid sink, countertop, or auto polish to maintain beauty and luster. It is versatility designed for both Drop-in and undermount ready for quick and easy installation. No mounting clips required for Drop-in installation. Plumbers putty for drains and silicone sealant for perimeter of sink is all that is needed. All Thermocast brand Cast-acrylic sinks are certified by the National Association of Home Builders Research Center and carry a Lifetime Warranty. The BLANCO PRECIS series is a modern SILGRANIT sink collection with unique design features like cascading divides and functional drainboards. PRECIS kitchen, bar and prep sinks are made from patented SILGRANIT material known for its Strength, Durability and Beauty. Exclusive to Blanco, with decades of development and manufacturing expertise, SILGRANIT is Canada's leading coloured sink choice. Smooth curves and rounded edges create a soft, organic look to the BLANCO VIENNA. These kitchen sinks are made from patented SILGRANIT. material known for its Strength, Durability and Beauty. Exclusive to Blanco, with several decades of development and manufacturing expertise, SILGRANIT. is Canada's leading coloured sink choice. Proudly made in Canada. 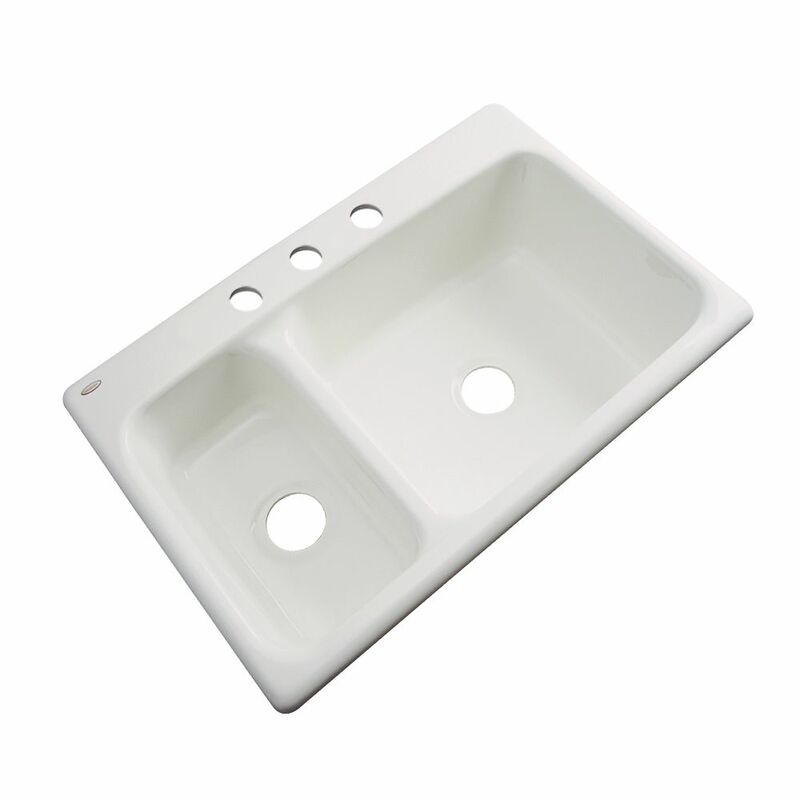 Crafted of durable fireclay, Alcott is reminiscent of vintage farmhouse sinks with its classic apron-front style. This undercounter sink also offers ultimate convenience with predrilled oversized faucet holes for quick installation. Extra holes accommodate accessories such as a sprayer or soap dispenser. Create an understated and elegant workstation with the Hawthorne double-basin kitchen sink. Inspired by farmhouse sinks, the under-mount apron front makes it a classic design choice for existing 33-inch apron-front cabinetry. Crafted from enameled cast iron, this sink resists chipping, cracking, or burning for years of beauty and reliable performance. Wyndham 33 Inch Double Bowl Biscuit Kitchen Sink It has the beauty of porcelain with strength of cast iron yet lighter weight. The insulated construction absorbs waste disposal noise and resists stain, rust, oxidation, chipping, and scratches. The surface can be polished with ordinary liquid sink, countertop, or auto polish to maintain beauty and luster. It is versatility designed for both Drop-in and undermount ready for quick and easy installation. No mounting clips required for Drop-in installation. Plumbers putty for drains and silicone sealant for perimeter of sink is all that is needed. All Thermocast brand Cast-acrylic sinks are certified by the National Association of Home Builders Research Center and carry a Lifetime Warranty. Wyndham 33 Inch Double Bowl Biscuit Kitchen Sink is rated 4.8 out of 5 by 5. Rated 5 out of 5 by Katie from We have had this installed now about a week and... We have had this installed now about a week and a half.It was easy to install and is light. The material feels cheap, like plastic. However, it looks nice. Sink does not come with strainer or disposal hole covers. Rated 5 out of 5 by tlrwmdw from Love our sink! Spacious and very sharp looking.... Love our sink! Spacious and very sharp looking. Rated 4 out of 5 by Suburbanite from Looks Good For Now I chose this sink because it would fit the cutout I have and it's light enough for me to install alone. Would have preferred a granite sink but they all require a slightly wider cutout. From underneath I can see where the light shines through in places where the fiberglass is thin. There are also gaps around the edge where it doesn't sit flat on the counter top and they will need to be filled with caulk. I had no problem putting in the drain, no leaks, but I did nick it in one place despite being very cautious. So far it looks good, I just hope the finish lasts for a couple years until I sell the house. Rated 5 out of 5 by Customer from I love it! I love the shape. It allows me to fit a big pan or dish in the right side and just let it soak there. It is stylish ang goes well withmy kitchen. Rated 5 out of 5 by frank from strong silent sink design was hard to find but knew Home Depot would have it. The large, deep right side handles everything up to and including the dog.